One of the great things about Japan (well, East Asia, or maybe East and Southeast Asia?) is 7-Eleven. Seriously. Anything you need, you can get at the convenience store. It's the place to go if you need a quick lunch or snack, stationery, toiletries, an umbrella, a magazine, a shirt, to pay your bills, or more minutes on your cell phone. And it's open 24 hours. In Germany, you can't buy aspirin at the grocery store (or the drugstore for that matter). Pharmacies are closed Wednesday afternoon. Everything is closed Sunday. Notice that you're out of floss Saturday night? Too bad. Many stores/offices close from noon to 2-3pm every afternoon. I'd think that many Americans would say that if isn't open during lunch hour, what's the point? And, of course, in Japan there are vending machines everywhere. 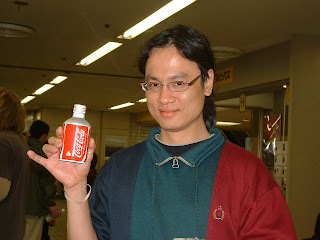 Eugene, by the way, was obsessed with these cans of Coke (aluminum cans with twist-off openings).